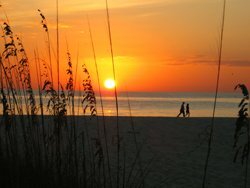 A Florida beach vacation on the Florida Gulf Coast can be fun, romantic, and cheap when you plan right. Why the Gulf Coast? The water is warmer, the beaches are beautiful, the cities and crowds are smaller, and there is a lot less traffic. When I go to the beach, I want to relax in the sun with a good book, take a walk, go for a swim, and take a nap. I also want to be close to unique little beach bars and some fun nightlife with dancing. Fortunately, I live here...but if I didn't, a Florida Gulf Coast vacation would be my focus if I was researching a stretch of Florida beach to visit. 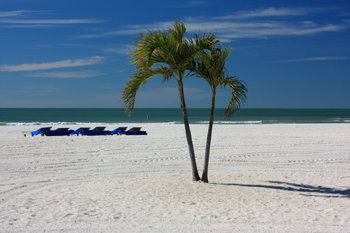 Every year, millions of people dream of finding the best Florida beach for a nice vacation. 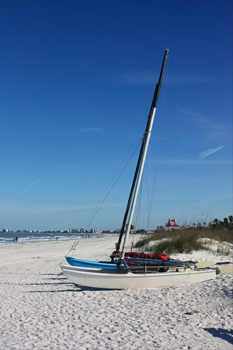 What could be more fun, adventuresome, and romantic than staying right on the shore of a white-sand Florida beach and hearing the waves lull you to sleep and the seagulls wake you? Bring your camera, bring your swimsuit and bring your sunglasses. Leave your worries back in the refrigerator at home. The Florida beach lifestyle is one to truly enjoy. It is easy to dream of days lounging in the sunshine...swimming in the clean Gulf water...and taking a quiet walk on the beach at sunset. However, if your partner has a completely different agenda (such as shopping or a couple of deep-sea fishing excursions) there is going to friction...and expense. If you will be taking a Florida beach vacation with children, another dynamic variable is introduced. Make no mistake, expenses and hurt feelings can add up quickly if the wants and expectations of everyone are not given valid consideration. Know ahead of time that compromises must be reached and give them plenty of time to be talked out. To me, the Florida Gulf Coast beaches are without equal for a wonderful vacation...but if one partner is forced to subordinate their wants too drastically, the beauty and quiet of the landscape cannot overcome feelings of resentment. For a nice Florida beach vacation, you want to maximize time and minimize expense. If you are the vacation planner, it is imperative to get everyone's input. It is not realistic to think everybody wants to spend every waking hour on the beach. It is also unrealistic to think you can adhere to a bare-bones budget if you truly want lodging directly on the beach. The nice thing about Florida Gulf Beaches is that they are close to some fun attractions (like the St Pete Pier in downtown St Petersburg,) as well as outstanding state parks within easy driving distance. 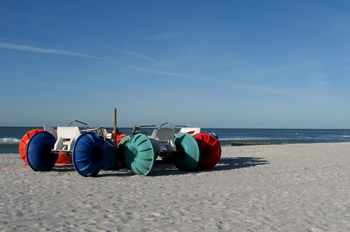 The Florida state park system is the largest in the United States. The majority of these parks provide picnic grounds and many have their own beaches. There are hiking and biking trails, along with fishing and even kayak rentals. A lot of parks are known for their specific wildlife habitats and birding is popular in almost all of them. If you have small children, a morning at the beach followed by an early afternoon at one of the parks can make for easy sleeping. In planning your beach vacation, be realistic about your finances. If you want to stay right on the beach, or in a beach resort...well, those accommodations are going to be higher. It will be the same with fancy restaurants and shops. Start planning early and learn about some of the area's Mom and Pop motels and great little beach bars which serve surprisingly good food. * Families staying for a week or more will normally benefit from staying in vacation rentals. Do your research. Make lots of phone calls. Always look to negotiate services or price. * Smaller motels, built in the late 50's and early 60's are surprisingly good bargains. Look for ones a couple of blocks from the beach and you will save $100's of dollars. Ask about everything connected with their services. Once again, always look to negotiate...especially price if you are staying for a week or more. * Travel only with carry-on luggage if you fly. Box and mail your heavier clothing ahead to the place you'll be staying. It'll run the same...or less than checking in another huge bag with the airline. Plus, it alleviates the hassle of accounting for your baggage. * Wherever you stay, make a sincere effort to get to know the staff. Find out where the locals shop and get recommendations for little places to eat that will save you money. * If you buy several t-shirts or bulky souvenirs, consider mailing them back to your home address. * Thoroughly discuss a stay at a resort. Resort selections can be wonderful for those wanting to take advantage of the plentiful amenities. However, if family members are not going to spend much time at the resort, this can be a very expensive option. Choose wisely...and always negotiate price. * If a visit to Disney World is part of your Florida beach vacation (it is about 95 miles from the Gulf Beaches), look at all options to save money...and reduce stress. Consider purchasing Beth Haworth's Ultimate Disney World Savings Guide . It is a downloadable eBook for $30 that can save you $100's...even $1000's of dollars. Maximizing your time spent on the beach and getting the best bang for your hard-earned money will make for a positive Florida beach vacation. You want your memories of Paradise to be wonderful, not filled with visions of credit card bills. What do I need to know about Stingray Season on the Florida beaches?